What will that fifty dollar shirt do that the ten dollar shirt won’t? The ten dollar shirt covers you in all the right places. When we make a case for a fifty dollar shirt over against a ten dollar shirt, it is important to discern if someone, a salesman for example, is suggesting the fifty dollar shirt will actually do more than a ten dollar shirt. Or, are we being lied to and what is suggested is not even related to what as shirt does. Or, is there really something a fifty dollar shirt will do that a ten dollar shirt won’t? Will Reading Gorgias Really Help Your Communication? Both Eric and Nathan use Gorgias in their respective teaching responsibilities. Eric teaches philosophy at Carroll College. When he was thinking what he would teach this Spring, he considered the language games demonstrated in the past election cycle and thought, Gorgias! Nathan teaches at Emmanuel College. While he does teach philosophy, he assigns Gorgias to his upper class students when teaching Rhetoric. 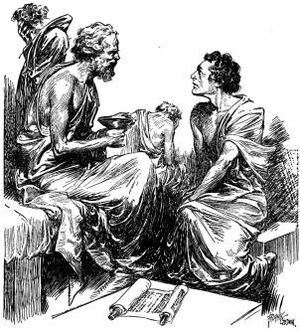 Both Nathan and Eric are well versed in Plato and what is getting done with Socrates. My interest in Gorgias grew from nothing to very curious after listening to Eric and Nathan talk about communication. When we kicked around the idea of doing a joint podcast, Gorgias would be our gateway into a number of future conversations. If, like me, you had never read Gorgias but wonder why it would be so important that two college professors would assign it to be read at their respective Christian schools, listen in. They provide a couple of accessible descriptions that provide several jumping off points for us to consider the value Socrates for preachers. If not, you still can. Both Eric and Nathan have been on the podcast. I interviewed Eric about his most recent book, Everything You Wanted to Know About the Almighty. In fact, it was reading this book that led to our conversation about a series of podcasts that would eventually get us to the various historical images of God Eric offers via cultural metaphors. Think about it. If we are going to talk about a counter-narrative to what passes for reality in the world, how we talk about God and how we connect people to and with God revealed in Jesus, then we might want to know that how we communicate may either be a misrepresentation/misdirection, a lie, or it might open people up to what is Good and True. Nathan came on the podcast to talk about his own podcast show, The Christian Humanist Podcast and Christian Humanist Profiles. These are two podcasts that are part of the Christian Humanist Radio Network. Nathan walked us through what lay behind his podcast. We then took a look at his intrigue and use of Dante. Recently I responded to a survey regarding theological education. What should be included in theological education on the college level. Knowing the genealogy, history, of ideas and current practices would be helpful. Or, knowing how to appropriate Socrates when talking about the revealed God in Jesus could be important in a de-sacralized culture, what some refer to as post-Christian. The voice for the normal intro questions is my middle grandson, Max. He was over for the evening and it made sense that a young inquisitive little boy remind us that everyone has questions. If you have questions, like I do, then the Socratic method may be one way you get at the heart of how to communicate the Good News of Jesus in a way that gets to the heart of what is Good and True and Beautiful.